Tecon Srl has more than 30 years’ experience in structural engineering consultancy in marine environments, delivering comprehensive and cost-effective solutions to customers, based on both material weight and configurations available. Our substantial experience gives us extensive knowledge of installation vessels and cranes worldwide, enabling us to provide the most economical and suitable solutions for installations. Tecon’s principle activities are the structural design and multidisciplinary projects of offshore platforms, oil and gas marine terminals, modules with stiffened walls, ports and jetties. We offer consultancy services for fabrication, handling, transportation and installation of heavy onshore and offshore structures, and assistance to clients for the design approval by statutory authorities, as well as during the certification process. Tecon performs engineering services for a number of Italian fabrication yards, including study and optimisation of erection sequences, engineering of roll-ups, lifts, load-outs. Our policy is to employ young engineers and technicians recently graduated, forming a team of professionals with ages ranging from twenties, up to team managers and shareholders with three decades of industry experience. We continually invest in acquiring and updating the most modern software packages to improve efficiency and enhance control of quality. Tecon’s quality management system is certified ISO: 9001-2008 by Lloyd’s Register Quality Assurance. Tecon has been active for more than 30 years in developing structural design of offshore platforms starting from the feasibility developed for oil companies and operators through FEED design, up to the detail design for fabrication contractors in the framework of EPC contracts and detail engineering of installation operations, equipment and structures developed for contractors. Our experience in dealing with the practical aspects of fabrication and installation allows an efficient collaboration with contractors. It also ensures a measured approach when facing the aspects of feasibility, FEED and basic designs, providing added-value also to these phases of projects. Tecon provides initial studies to select the best methods and layout to final detail design for oil companies, facility operators or fabrication and installation contractors for marine terminals such as land-rooted jetties, port quays, detached platforms, mooring buoys systems. We investigate coastal geology and dredging conditions, possible mooring solutions at the berth, and the berth response to various oceanographic conditions to define the jetty position and orientation. We have regularly taken full control of the piping and E&I activities for terminals, carrying out the services of specialist sub-contractors. The most complex aspect in the structural design are foundations due to the extremely high loads that must be carried, as well as the difficulty of receiving complete soil data in the early design schedule. For this reason, Tecon has developed long-term collaborations with the most renowned and reliable geotechnical experts globally who support Tecon engineers. When carrying out the structural design of offshore platforms and marine terminals, it is crucial is to take the impact of earthquakes into consideration. Tecon engineers have extensive experience in this field and a number of them have also substantial scientific knowledge of this area, including scale dynamic measurements and structural design methods based on displacement spectra. Tecon’s experience in helideck design comes from both the design of structures topped by a helicopter landing facility and the multi-annual cooperation with one of the biggest suppliers of aluminium helipads, which we developed the design of tens of helideck support structures for. All normally manned areas of topsides structures in harsh environment need to be completely enclosed. The use of stiffshell walls contribute to the overall structural resistance, eliminating the bracings ensures weight savings and fabrication simplifications. Tecon has developed post-processing software for the code checks of these non isotropic stiffened walls against various national codes. Tecon is a leading Italian engineering consulting company in the field of structural offshore/marine engineering, providing comprehensive design, project management, construction and installation supervision services for offshore and marine structures. 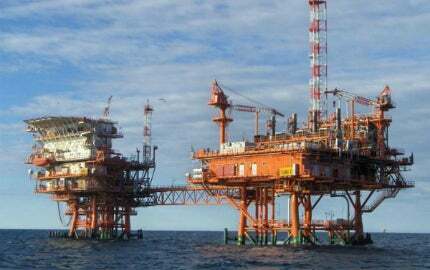 The Marlin oil and gas field is located within the offshore Block CI-27, approximately 70km south-west of Abidjan, Cote d'Ivoire. The West Franklin field, located in Blocks 29/05b and 29/04d of the UK Continental Shelf (UKCS), was discovered in 2003 and started production in 2007.